An orchestra is only in tune as accurately as the worst-tuned guitar, and so hago tune up frequently. 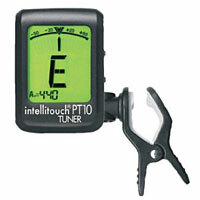 In order to tune quickly and discreetly, hago uses a number of Intellitouch tuners, which work by contact, and allow all the players to tune at the same time. Being fully chromatic, there is nothing to "fiddle with" when tuning the alto or bass guitar.